Book Creator brings the potential for classroom collaboration without borders, as these two teachers discovered. In spring 2013, the students of Burley School in Chicago, Illinois, and Arskóli in Saudarkrokur, Iceland embarked on a journey to collaborate and co-author with each other. At the time, third graders at Burley were engaged in an inquiry unit about the tundra. As students researched people of the tundra, they found plenty of information about native people from long ago, but little information about kids their age or modern life. Burley’s technology specialist, Carolyn Skibba, reached out to a distant friend and colleague, Ingvi Hrannar Omarsson, whom she had met when he visited her school to learn about iPad integration. During Ingvi’s visit, they had talked about one day connecting their students, and this seemed like the perfect opportunity. This is their joint reflection. Student learning comes first in any collaborative project, and we both knew that this international partnership presented a unique opportunity for our kids. For Chicago students, connecting with kids in Iceland would offer a glimpse into a different culture, land, and climate and bring their tundra study to life. For the students in Iceland, this was an invaluable opportunity to practice their emerging English language skills. For kids in both countries, having an authentic audience would spark new purpose for their reading, writing, and technology use. The collaboration was on! Except… we didn’t really have a plan. 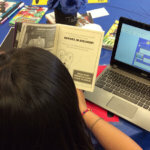 At a local conference, Carolyn had seen a multimedia bilingual book entitled Our Batak House (created by Apple Distinguished Educator Jane Ross) and had been captivated by its simple, effective format. As we discussed our options for collaborating, we thought that a similar project would be a good starting point for collaborative publishing. We also felt that the incorporation of audio would support Ingvi’s English language learners, Chicago’s Icelandic language novices, and curious readers of all ages and abilities who would read our book. We both knew that Book Creator would enable the kind of multimedia publishing we envisioned, and it would also make it easy for our work in progress to be shared via Dropbox. Before diving in to the book, we knew it was critical to lay some groundwork with the kids. We started with blog posts through which the students introduced themselves. Ingvi’s students produced videos and posted them for our comments and feedback. Students in both countries created images in PicCollage to give one another a sense of their classrooms and schools. This gave us the opportunity to talk to students about what an image tells you about a place, how to decide what to capture and share, and how to draw the viewer’s attention to what you want to show. Finally, we both recorded and posted short audio files, using Croak.it on our blogs so our students could hear one another speak. As we were wrapping up our getting-to-know-you process, we were also preparing for our authoring process. We brainstormed simple categories – homes, streets, schools, food, pets – that students could photograph to illustrate daily life in our respective hometowns. Students in both locations captured photographs, and we gathered the images for our upcoming publication. We also included student audio recordings for all the text in the book. This straightforward format was an excellent starting point for engaging in this kind of project. Of course, the simplicity of Book Creator made a huge difference. As long as we followed a “taking turns” approach so we weren’t both working on the book at the same time, sharing the book file between countries was a snap. After a few digital trips back and forth across the ocean, our book was finished. As is the case with many projects, Faraway Friends left us wondering: What’s next? How can we use collaborative authoring to explore shared inquiry? How can we work together to address global issues? How could students engage in the scholarly work of gathering, exchanging, and publishing data about our respective locations? These are some of the questions that will guide the continued evolution of collaborative publishing in our schools. We were very pleased with Book Creator and its collaborative features, and we hope this post encourages you to collaborate across schools, cities or even countries. Book Creator (on the iPad). Readium Google Chrome Extension (on a computer). In September 2013, Carolyn recorded a webcast with the EduSlam team about this project. Dan Kemp is Red Jumper’s Community Manager. He spends his time spreading the word about Book Creator and supporting people who use it.